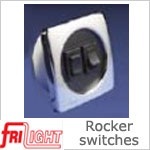 FriLight 12 volt switches (and 24 volt) are part of our Color Collection, and can be color coordinated with many of our FriLight Light Fixtures, including Reading Lights and Ceiling Lights. 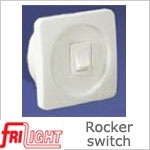 The compact size and stylish look of these switches makes them a classic. Part of our versatile Color Collection. 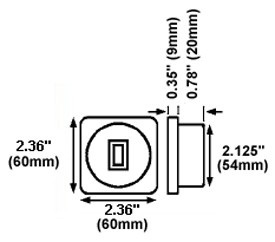 Choose from 5 bezel colors and 2 face colors. Colors can be coordinated to match various light fixtures. 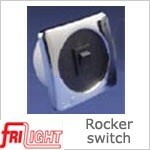 Switch & Face Colors: black face & rocker switch; white face & rocker switch. 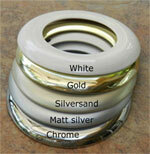 Bezel Colors: Chrome, Gold, Matt Silver, Sandstone, White. 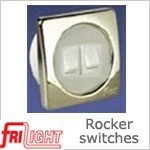 Switch & Face Colors: black face & rocker switches; white face & rocker switches.